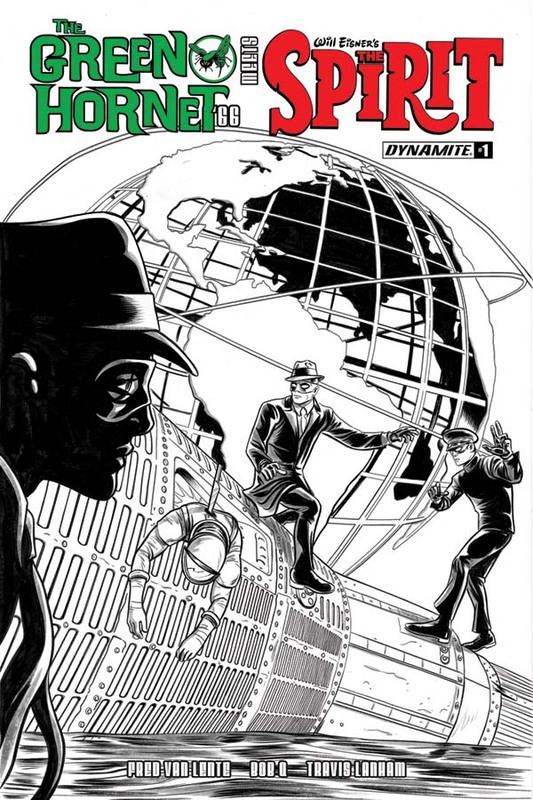 Dynamite Entertainment is proud to announce that classic television’s incarnation of The Green Hornet is set to make his return with an unexpected new partner in the pulp character’s latest cross-over miniseries, The Green Hornet ’66 Meets The Spirit, featuring revered comic writer/artist Will Eisner’s famous two-fisted crimefighter. 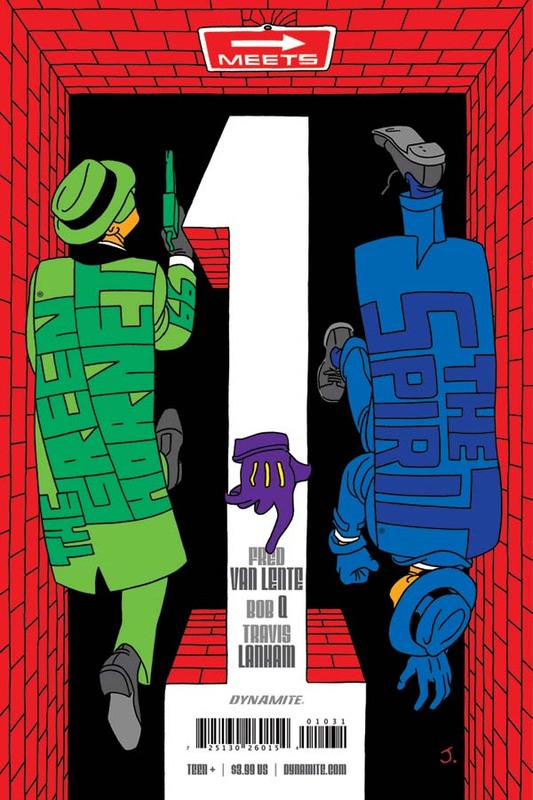 Written by Fred Van Lente (Archer & Armstrong, Cowboys and Aliens), with art by Bob Q (Kings Quest), The Green Hornet ’66 Meets The Spirit #1 arrives in stores this July! 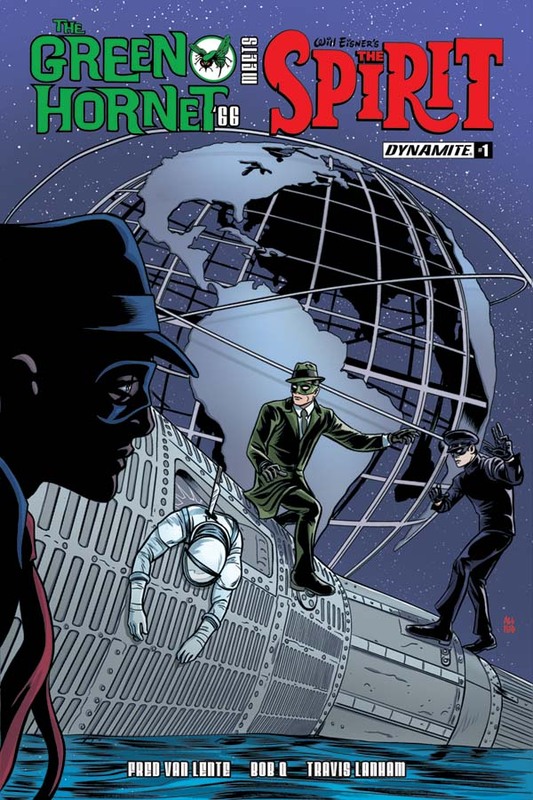 The Green Hornet is back and on the case! With his aide Kato and their rolling arsenal, The Black Beauty, by his side, The Green Hornet is ready to face the toughest of challenges! 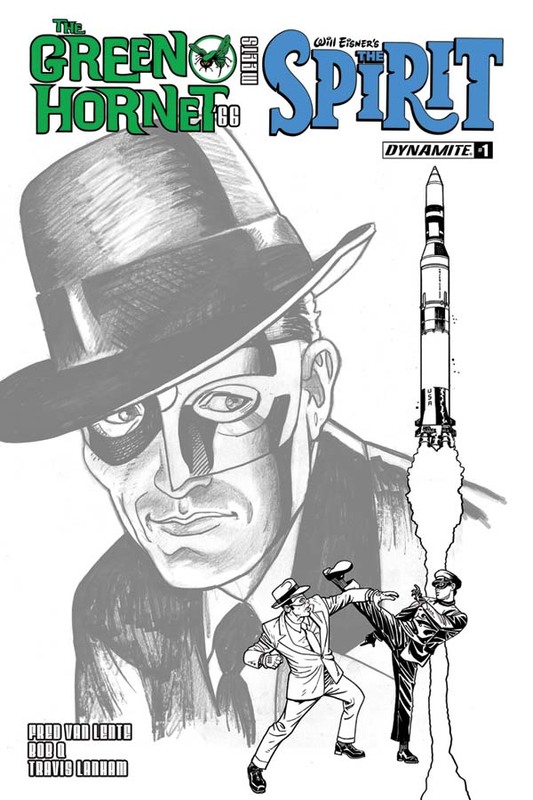 On police records a wanted criminal, The Green Hornet is secretly Britt Reid, owner/publisher of The Daily Sentinel. Reid and Kato have traveled to Central City to participate in the futuristic World’s Fair, and to get the skinny on the new and potentially dangerous “Newspaper of Tomorrow“, a device capable of predicting headlines before events happen. Fred Van Lente is the #1 New York Times bestselling, award-winning writer of comics like Dynamite’s The Mocking Dead and Magnus: Robot Fighter, Archer & Armstrong (Harvey Award nominee, Best Series), Action Philosophers! (American Library Association Best Graphic Novel for Teens), and Cowboys & Aliens (with Andrew Foley), the basis for the feature film. The debut issue of The Green Hornet ’66 Meets the Spirit features a wide selection of cover variants, providing fans and retailers with the freedom of choice! The cover artwork features the talents of the award-winning husband and wife team, Mike and Laura Allred (Batman ’66, X-Force, iZombie), Ty Templeton (Batman 66, The Simpsons) and Javier Pulido (The Amazing Spiderman, Robin: Year One), respectively. Limited variant editions in “Black & White” and “Virgin Art” formats are also available as retailer incentives for comic shops that support the launch issue by achieving stocking thresholds. 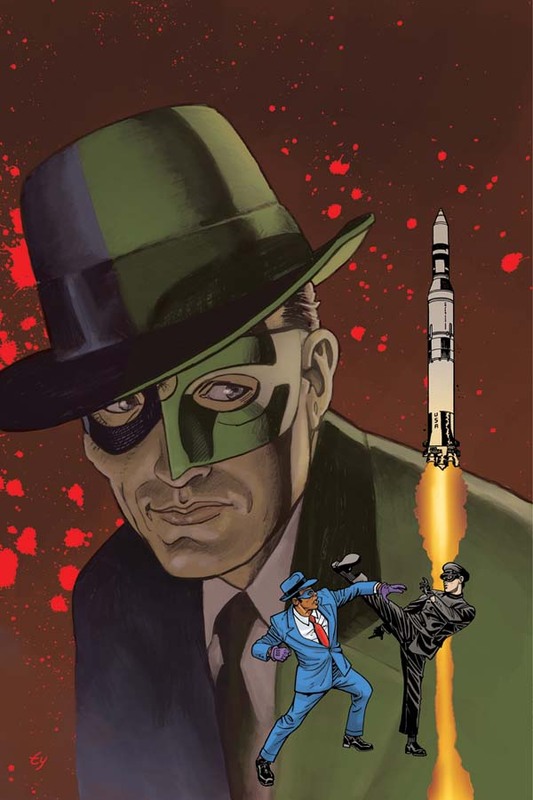 The Green Hornet ’66 Meets the Spirit #1 will be solicited in Diamond Comic Distributors’ May 2017 Previews catalog, the premier source of merchandise for the comic book specialty market, and slated for release in July. Comic book fans are encouraged to reserve copies with their local comic book retailers. 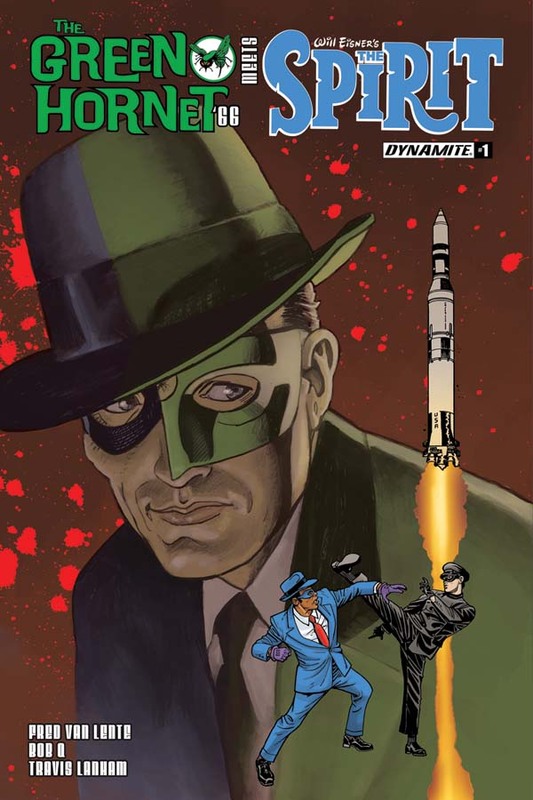 The Green Hornet ’66 Meets the Spirit #1 will also be available for individual customer purchase through digital platforms courtesy of Comixology, Dynamite Digital, iVerse, and Dark Horse Digital.